“I learned that we can talk without speaking” – says E.
Elisa Biava and Marco Cinnirella are two of the Social and Community Theatre™ trainers engaged in the psycho-social intervention “I don’t travel alone”, developped by SOS Children’s Villages in partnership with SCT Centre. They tell us what it means to work with unaccompanied foreign minors in the Reception Centers in Crotone (Calabria) and the new things they find out every day. Marco and Elisa meet the children on a weekly basis and run workshops on Life Skills with them. “I learned that we can talk without speaking,” says E.
We have just concluded a group activity in which we have mimed actions that, little by little, had become less costumary and had turned into the expression of their dreams (E. auscultates the chest of a companion, O. sings), of their own experience (M. shoot with a rifle, I. whip the companion next to him), and their own desires (S. draws a girl in the air and dances with her in the middle of the circle). During the workshops at the Reception Centers, where words struggle to go out because the children do not know how to name things or can’t translate what they have in mond, I see them discovering the time of listening and giving value to non-verbal language. Who is around you? Who are the people, near or far from you, with whom you can talk? 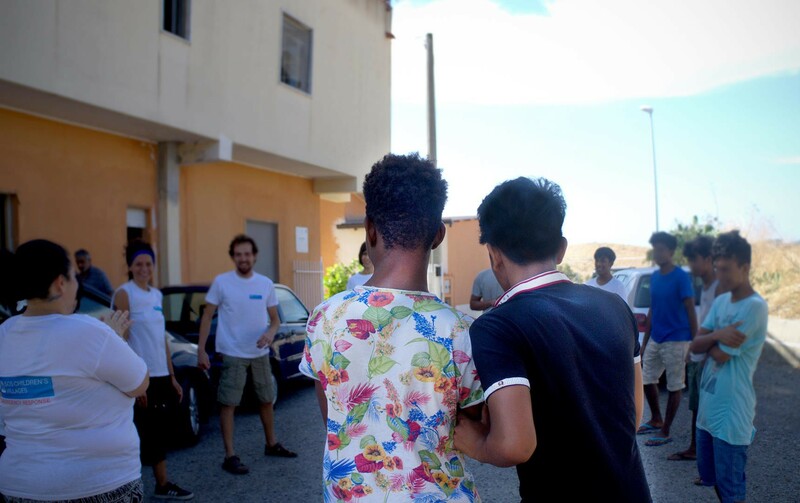 Through theatrical exercises we ask them to tell something about themselves, with the aim of creating moments of sharing that, probably, in the daily life of the Reception Centres are rare. The opportunities to meet with their Italian peers are few and made difficult by distrust. But the desire to go out and discover “Italy” is so powerful. “I think about what life is like. I think of my family in Africa. When you asked me to draw something, I drew backpack because I want to go to school here in Italy. To know what life is like. ⇐ Cosa ha reso l’uomo in grado di dominare il mondo e cosa c’entra questo con il teatro?